A 9-day Beer Lovers’ Tour of Iceland. The Beer Lovers’ Tour Company, Merit Travel and Lamb Inn Travel have combined our passion and experience to create an itinerary that takes us on the road less travelled to magical Arctic Iceland, the heart of the craft-brewing renaissance. Join us for the adventure of a lifetime! Upon arrival at Keflavik International Airport around 11.40 p.m we will be met and transferred to The Guesthouse Alex only a few minutes away. This down-to-earth seasonal guesthouse has a dining area where we might have a quick nightcap before heading off to sleep. After a delicious Icelandic breakfast and brief orientation we will meet our fabulous Icelandic guide, storyteller and driver, Sólveig Haraldsdóttir. Then its all aboard on our private coach as we head north to Borgarnes, the capital of West Iceland. There we will visit Borg at Myrar where one of the first Icelandic settlers, Skallagrimur Kveldulfsson and later his famous son, Egill Skallagrimsson, lived. We then make our way to the Icelandic Settlement Center in Borgarnes. There we will learn about the first settlers in Iceland and Egils-saga, one of the most famous Icelandic myths. Lunch buffet will be in the Settlement Center restaurant. After lunch we will stop at farmers market Ljómalind in Borgarnes before we head out to the countryside. The next stop is Steðji brewery, famous for its exotic Hvalur (Whale) beer. Here we will enjoy some samples in their special tasting room. From Steðji we will continue our tour towards Hótel Á, where our second night’s accommodation and dinner will be. On the way we will stop at Deildartunguhver hot spring and the famous Reykholt, where early Icelandic poet and historian Snorri Sturluson once lived. Dinner and overnight at Hótel Á. 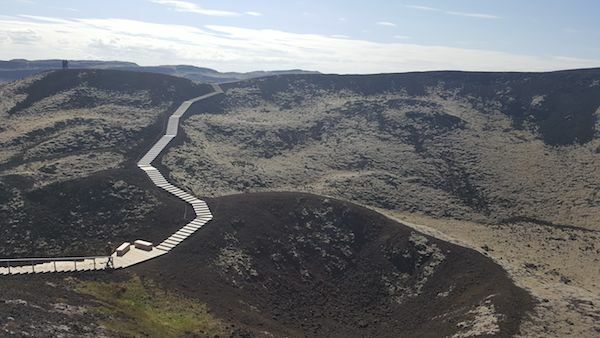 Continuing north after breakfast we will enjoy a visit to the Grábrók volcano crater. Our lunch stop will be in the town of Hvammstangi home of the Seal Research Center . On the 2nd floor is a new restaurant, Sjávarborg, where we will relax over lunch. Continuing on our journey, we will drive through the seaside town of Saudarkrokur, located in the picturesque Skagafjordur valley. A photo stop there by the town’s cemetery gives us a spectacular view over the town, the purple lupine-covered mountains and Islands in the bay. Heading north we visit the Icelandic Emigration Center in the beautiful port town of Hofsós. We will attend a guided tour of this exquisite museum exhibition where visitors learn of the late 19th century Icelandic exodus to Manitoba and parts of the US. Solweig, our fabulous tour guide talking to the one of the local brewers sporting a t-shirt with her name. Then it is off to Holar, important historical centre and home to a university and Iceland’s only Beer Festival. Here we will have the chance to meet key players and beer lovers in the exploding Icelandic craft beer scene and sample many of the best local brews in one convenient location. Dinner and overnight is at Holar University Campus. Hólar’s famous Arctic Char is on the menu tonight. This morning we head along the rugged coastline to Siglufjordur, a picturesque fishing village set against a snow-capped mountain scene. It is also where Segull 67 Micro Brewery is located, a new craft brewery that only started producing beer in December 2015. We will enjoy their products at the brewery, located in an old fish freezing plant. Then we will have some free time to explore, shop and have lunch at Hannes boy before we visit the award-winning Síldarminjasafnið Herring Museum; the largest marine and industrial museum in Europe. 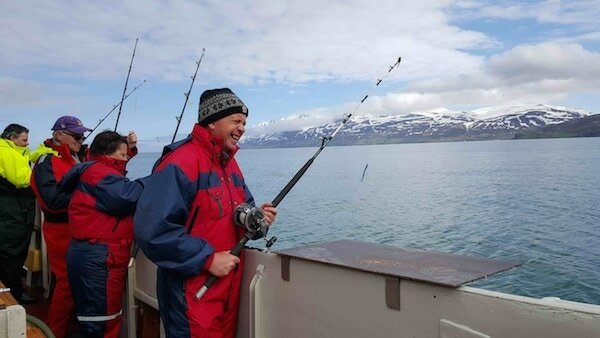 This is an impressive historical site that brings to life the fishing history of Iceland and how the town of Siglufjordur played a vital role. Continuing our journey, we will arrive at the Lamb Inn Guesthouse in Öngulsstadir around 5pm, which will be our base for the next several days. Located in a gorgeous mountain valley, the Lamb Inn Öngulsstaðir is a family business operating on a farm property that was renovated into a guesthouse in 1996. After check-in, a welcome reception will be held at The Old Farmhouse by owners Karl and his father-in-law Johannes. Dinner and overnight at the Lamb Inn enjoying a seasonal specialty, smoked lamb followed by dessert. After breakfast we pack our bathing suits and towels and drive to Lake Myvatn with a stop at the Goðafoss waterfall. The Goðafoss (Icelandic: waterfall of the gods or waterfall of the goði) is one of the most spectacular waterfalls in Iceland. In the year 1000 the Lawspeaker Þorgeir made Christianity the official religion of Iceland. After his conversion it is said that Þorgeir threw his statues of the Norse gods into the waterfall. We then travel to the Dimmuborgir area which consists of a massive, collapsed lava tube formed by a lava lake flowing in from a large eruption about 2300 years ago. At Dimmuborgir, the lava pooled over a small lake. The area is characterised by large hollow cell- or chamber-like structures formed around bubbles of vapour, and some dramatically standing lava pillars. Several of the chambers and pillar bases are large enough to house humans, giving rise to the term "castles" (borgir). Lunch is at the cow shed restaurant Vogafjos. The geothermal area Hverir by Námaskarð is a high temperature zone where you find steaming fumaroles, bubbling mud pools and the thundering Dettifoss Waterfalls. It was also a location for several feature films including Star Wars. Dettifoss is situated on the Jökulsá á Fjöllum river, which flows from the Vatnajökull glacier and collects water from a large area in Northeast Iceland. 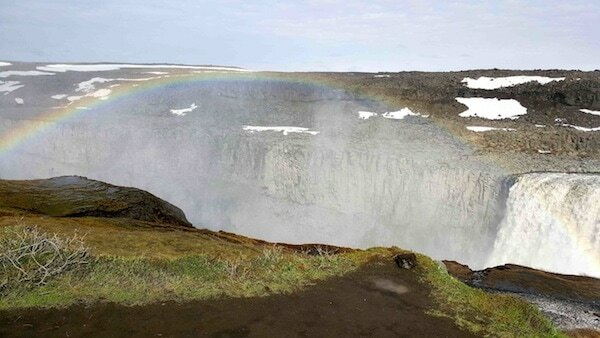 The falls are 100 metres (330 ft) wide and have a drop of 45 meters (150 ft) down to the Jökulsárgljúfur canyon. It is the largest waterfall in Iceland by volume. Time to unpack those bathing suits since the Myvatn Nature bath is the latest addition to the region’s many visitor attractions. Drawing on a centuries-old tradition, the tastefully designed complex offers bathers a completely natural experience that begins with a relaxing dip in clouds of steam rising up from a fissure deep in the Earth’s surface, and ends with a luxurious swim in a pool of hot geothermal water drawn from depths of up to 2,500 m.
We take time to relax with a cold beer in hand at the Mývatn Nature baths before heading back to Lamb Inn for dinner of specially prepared Icelandic cod. The day starts with a morning whale watching tour after breakfast from Hauganes 30 km north of Akureyri. After the Whale watching tour we will visit the first independent microbrewery in Iceland, Bruggsmidjan, brewers of the very popular Kaldi beer. 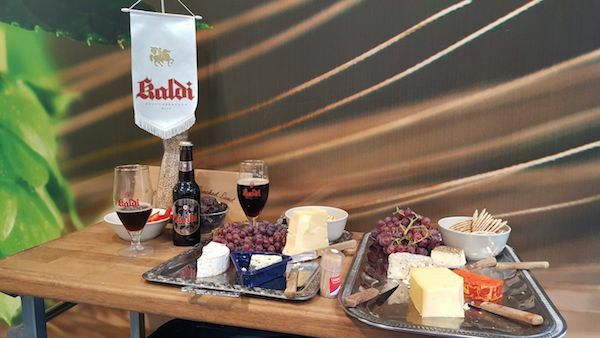 Along with the different beers we’ll enjoy a tasting of locally made cheeses. Interestingly, 80-90% of all cheeses in Iceland are made in the dairy factory in Akureyri and 10% of all the milk production in Iceland comes from the community of Eyjafjarðarsveit, where Lamb Inn is located. At Bruggsmidjan we have the option to suit up and dip into a brand new hot tub filled with beer ingredients at Kaldi Beer spa! Lunch will be either at Kaldi or Ektafiskur. The rest of the day is free to explore the town of Akureyri with all its attractions, museums and culture. Dinner is back at the Lamb Inn for the house specialty: Roasted leg of lamb. Icelandic lamb is regarded to be the finest in the world. After dinner we will be treated to an entertaining “Beer night“ celebration at the Lamb Inn to which locals have been invited. Sverrir Hermannsson's Sundry Collection, an eccentric museum experience. We’ll also stop at The Christmas House, perfect for those who can’t wait ‘till December. Then we’ll head to Garðsárgil Canyon where we will enjoy a beer tasting in a spectacular natural setting hosted by the Viking/Einstok brewery. We then head off to visit the charming home and workshop of Beate and Helgi. 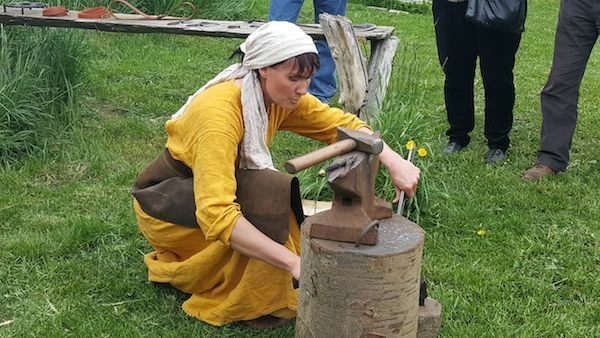 Beate is a black smith who has specialized in Viking era traditions. She is the Icelandic and Nordic blacksmith champion for 2015. Her partner Helgi is a musician and story teller who dresses in a period costume and performs ancient songs while playing an original instrument. Maybe we’ll sneak a little taste of local “Moonshine” which Icelanders call Landi . We have lunch at the cow shed restaurant/café Kaffi Q. We will be served their famous goulash soup made with their own beef. On the menu tonight back at Lamb Inn: traditional Icelandic Fish Gratin followed by Dessert. Later we have the option to head back to Akureyri to explore the nightlife during the time of the Midnight Sun. After breakfast we will head south towards Reykjavik. Pausing from our scenic drive, we will enjoy a buffet lunch at the Hraunsnef restaurant. After check in at KEA Hotel Skuggi in Reykjavik we will have free time to explore the downtown. No dinner is planned this evening, so it’s a free choice for everybody. Pubs in Reykjavik abound where local microbrewery beer is served. Kormakur and Skjoldur Taverns serve the exclusive local beer, Brio. After breakfast there will be some free time in Reykjavik before leaving for the airport. On the way we’ll have time to stop at the Viking World, an interactive museum with varied exhibitions about the Vikings, their culture and their history. You may wish to purchase your own lunch there. Then it is off to the airport where we say adieu to our fabulous Icelandic tour guide, Sólveig Haraldsdóttir. · Local expert guides at destination. · Transportation in a private mini coach. · Eight nights accommodation as per the itinerary. Please note that in Iceland, hotels rooms tend to be more modest than the typical North American chain, with spartan but spotless decor, and twin beds. · Eight breakfasts, seven lunches and six dinners. All beer tastings. Other than specified beer tastings, the cost of alcoholic beverages is not included in meals. · Access to all planned visits, museums and other activity and attractions in the itinerary. · Any personal items such as passport fees, telephone calls, travel insurance etc. Solveig our Icelandic Tour Guide. Local Tour Guide: Your icelandic guide and driver will be certified tourist guide Solveig Haraldsdottir. A fountain of knowledge, Solveig has a BA in history and is a masters level teacher. A 'country girl', who grew up in northern Iceland, she currently resides in Akureyri town in the North, where she balances her busy family life with teaching, story telling and guiding. We will be in great hands as Solveig is a full-time tour guide all over Iceland and will immerse us in the culture, history and landscape of Iceland. Her personal favourite quote is, "Enjoy the moment and relax." Contact Georgia at Merit Travel for details and flight information.​Travel Services by Merit Travel TICO# ON-4499356/4499372 BC-34799 111 Peter Street , Suite 200 Toronto M5V 2H1.